Like all Americans old enough to remember the events of 9/11/2001, I have a very vivid and raw memory of that morning. That day would come to define some of my life's most important decisions; would drive me to a career in public service and safety. A flower in the memorial to the World Trade Center. The shadow of One World Trade casts across the memorial. This photograph is very powerful to me. I was standing outside the museum and noticed a jetliner flying over One World Trade. My mind started racing with thoughts.... anywhere else in the world, seeing a plane fly over a building is so routine, that it hardly registers. But here, it seemed raw. This is a view similar to the one thousands saw on 9/11 - but with a very different outcome. I took four images of the plane's track over New York City and combined them in this composite. The 9/11 memorial and museum only opened in the past few years, and while I have seen the outdoor memorial ponds before, I never had a chance to visit the museum until this most recent trip to New York City. I was a bit conflicted about taking photographs in such hallowed ground. Artists painted 3,000 cards a slightly different shade of blue - each one painting the color of the sky they remember seeing on 9/11. 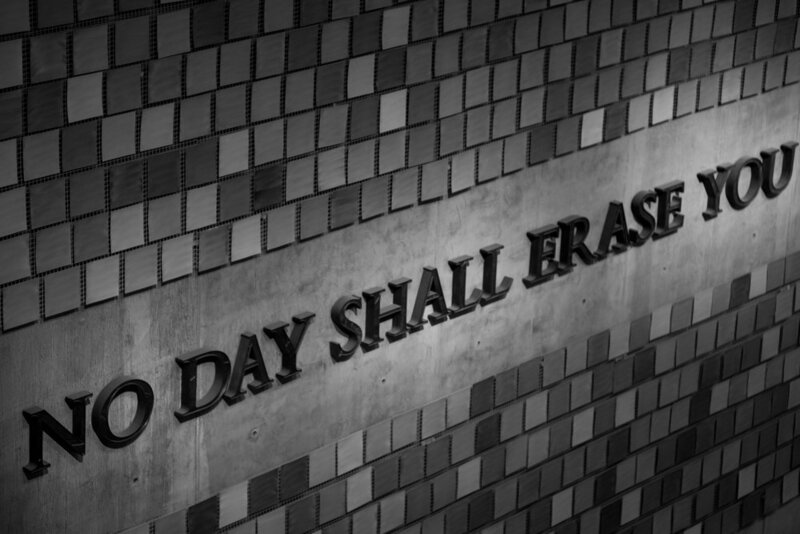 These cards now hang on a wall as a reminder that the memory of those lost on 9/11 cannot be erased. September 11th isn't a tourist attraction. The artifacts and memories captured in this museum mark millions of lives changed in the span of a few terrible minutes. I don't want to disrespect the memory of the over 3,000 innocent people killed on that day by turning 9/11 into a photography spectacle. 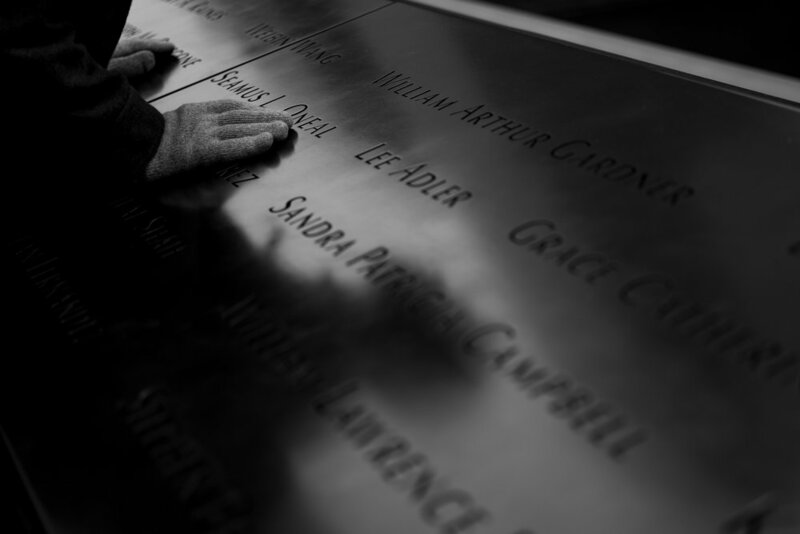 A visitor to the memorial paying tribute to some of the victims from 9/11. A message from supporters of Ladder Company 3; this was part of a fire truck that was smashed when the towers collapsed. But after a few minutes in the museum, my opinion changed. September 11th was the most terrible of days, a day that we cannot forget. Walking through that museum reopened the emotions from that day that I had long since repressed. I was flooded with sobering memories of what happens when we become complacent and when freedom is not allowed to prosper around the world. A section of steel from inside the World Trade Center. This particular piece came from the area where the first aircraft tore into the tower, gashing a hole in one of America's most iconic buildings. Names and organizations listed on the memorial wall surrounding the pools in the memorial. Recognizing that many viewers to my website will never have a chance to visit the museum in NYC, I decided to make a handful of photographs that could help convey the emotions and experience I had walking through the museum. Four tie-down points. The museum is underground and some of the foundation walls that made up the twin towers are incorporated into the structure of the museum. This part of the foundation remains in the original location. It is one of the few pieces of the towers that still remains as it did on September 11th. Less than a block from the World Trade Center is a fire station home to ladder company 10. Six fireman from this company died rescuing others on 9/11. I cried twice in the museum. Once while looking at / listening to a selection of voicemail messages left by passengers of those doomed flights to their loved ones. People who left a final message, knowing their fate. I crumbled under the idea of ever having to do something so brave. My second breakdown happened in front of a projection of "missing posters" hung by friends and family searching for their lost relatives. Many of these posters carried a deeply personal message, and my heart broke for every family that had to write a sign like that. One particular sign that pulled me was from a daughter looking for her daddy. Memories attached to the "last column" - this was the last piece of steel removed from the site. Prior to it's removal, it became a shrine of sorts, with family and friends affixing messages, photos, and flowers to the beam. The top of the last column, with messages and photos to loved ones lost on 9/11. I could not photograph these things. I could not bring myself to make artwork from the pain of those families. Instead, I chose to photograph objects that were more symbolic of the tragedy. A close-up of some of the memories written upon the "last column".